A major commuter rail company is to run the last of its scheduled slam-door trains on Thursday. 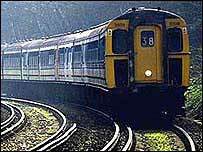 The 12-car slam-door train was run by South West Trains (SWT) from London's Waterloo to Weymouth in Dorset. Only a handful of slam-door units - operated by the Southern and South Eastern train companies - will now remain in mainline passenger service. The Mark One trains were due to be taken out of service by the end of 2004, but the deadline was extended. SWT's slam-door trains have been replaced with modern Desiro units. They will have run more than one billion miles and had 10 repaints. Graham Eccles, SWT chairman and managing director, said: "Slam-door stock has been part of life in southern England for the last 40 years and every day they have brought hundreds of thousands of people into London. Two of SWT's slam-door trains will be kept on to run on a heritage line at Lymington in Hampshire and a third is being kept for a charity run next month.